The workhorse for asphalt contractors, this articulated, vibratory roller can be deployed on many jobs usually reserved for larger asphalt rollers. Multiquip meets contractors’ needs by providing the right roller for virtually any job application. The MULTIQUIP AR13G Double Drum Vibratory Roller is built for asphalt and sublayer granular and mixed soil compaction jobs. Articulated movement with power-assist provides accurate, positive steering control and increases maneuverability in confined job sites. 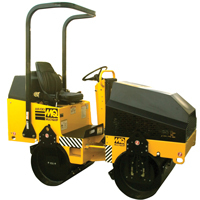 Designed for compacting asphalt and sublayer granular and mixed soils. Hydrostatic drive with variable speed control for both forward and reverse travel.